The challenge hopes to raise awareness about equine adoption. All competing horses will be available for adoption after the event. Pre-approved adoption applicants may bid on the horses available. 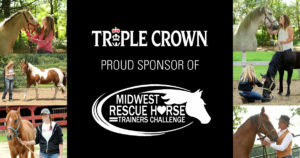 Triple Crown is excited to be fueling all of the challenge horses with the right Triple Crown feed for their needs. With the help of impeccable nutrition and the care and handling from talented and enthusiastic trainers, we can’t wait to follow the progress of these horse and rider teams! The challenge will take place on Saturday, September 22nd at 10am at Jefferson County Fair Park in Jefferson, WI. Aside from attending, there are many opportunities to get involved with the event. The public is encouraged to donate to a silent auction, sponsor the event, or sponsor a horse.